In following section we will explain how to configure wifi on orange pi. Orange Pi should already have armbian installed/configured and connected to your router though a LAN cable. If armbian is not already installed/configured read this first. This will open a GUI like interface on terminal select activate a connection, use arrow keys and tab to select option and enter to go to next step. Once OK is pressed next screen will appear showing wifi connections available, choose your wifi and select activate before pressing enter. you will be prompted for password, provide the password and the enter after selecting OK.
ip under wlan0 is your wifi inerface IP. Are you a big Google drive user? Do you Download Torrents to Google Drive? Believe it or not but it is now possible to save your torrents directly to Google Drive. This has a lot of advantages, which include super fast, anonymous downloading of torrents, and automatic synchronization via Google Drive sync. CloudBox247 already allows you view your torrents directly in the browser on all your devices. If you are a Google drive user and want to have it synced across all your devices, then there is a way to directly save into your Google Drive while downloading a torrent. When downloading through CloudBox247, make sure you choose -> My Account -> Google Drive Account -> Authorize -> Select Automatic Backup. It will then automatically download into your drive. It is very simple! Create an account free here. You will see the opening preview credits in the first link and in the second, it should have the first 55.5 seconds removed from the original video file. Today I spent some time to compile ffmpeg libs on Windows. Most documentation out there is not updated to 2015, yet compiling ffmpeg on Windows is pretty easy. If you’re looking for a copy and paste solution, keep reading. Latest ffmpeg versions compile both with Visual Studio 2013 and 2015. Previous versions don’t compile with VS2015 because they expect that VS compiler has no snprintf support while it was introduced in VS2015. Fmpeg is an extremely powerful and versatile command line tool for converting audio and video files. It is free and available for Windows, Mac and Linux machines. Whether you want to join two video files, extract the audio component from a video file, convert your video into an animated GIF, FFmpeg can do it all and even more. Extract the audio from a video file with this simple FFmpeg command. FFmpeg supports all popular audio and video formats. Or you can running the command ./ffmpeg -formats to get a list of every format that is supported by your FFmpeg installation. If you are just getting started, here are some commands that will give you good idea of the capabilities of this tool. You can use the time offset parameter (-ss) to specify the start time stamp in HH:MM:SS.ms format while the -t parameter is for specifying the actual duration of the clip in seconds. If you want to split a large video into multiple smaller clips without re-encoding, ffmpeg can help. This command will split the source video into 2 parts – one ending at 50s from the start and the other beginning at 50s and ending at the end of the input video. You can use the -vcodec parameter to specify the encoding format to be used for the output video. Encoding a video takes time but you can speed up the process by forcing a preset though it would degrade the quality of the output video. If you have multiple audio or video files encoded with the same codecs, you can join them into a single file using FFmpeg. Create a input file with a list of all source files that you wish to concatenate and then run this command. Use the -an parameter to disable the audio portion of a video stream. The -vn switch extracts the audio portion from a video and we are using the -ab switch to save the audio as a 256kbps MP3 audio file. FFmpeg is an excellent tool for converting videos into animated GIFs and the quality isn’t bad either. Use the scale filter to specify the width of the GIF, the -t parameter specific the duration while -r specifies the frame rate (fps). This command will extract the video frame at the 15s mark and saves it as a 800px wide JPEG image. You can also use the -s switch (like -s 400×300) to specify the exact dimensions of the image file though it will probably create a stretched image if the image size doesn’t follow the aspect ratio of the original video file. You can use FFmpeg to automatically extract image frames from a video every ‘n’ seconds and the images are saved in a sequence. This command saves image frame after every 4 seconds. You can also specify the -shortest switch to finish the encoding when the shortest clip ends. Use the size (-s) switch with ffmpeg to resize a video while maintaining the aspect ratio. This command creates a video slideshow using a series of images that are named as img001.png, img002.png, etc. Each image will have a duration of 5 seconds (-r 1/5). You can add a cover image to an audio file and the length of the output video will be the same as that of the input audio stream. This may come handy for uploading MP3s to YouTube. Use the -t parameter to specify the duration of the video. This will take the subtitles from the .srt file. FFmpeg can decode most common subtitle formats. This will create a 30 second audio file starting at 90 seconds from the original audio file without transcoding. You can use the volume filter to alter the volume of a media file using FFmpeg. This command will half the volume of the audio file. This command will rotate a video clip 90° clockwise. You can set transpose to 2 to rotate the video 90° anti-clockwise. This will rotate the video 180° counter-clockwise. You can change the speed of your video using the setpts (set presentation time stamp) filter of FFmpeg. This command will make the video 8x (1/8) faster or use setpts=4*PTS to make the video 4x slower. For changing the speed of audio, use the atempo audio filter. This command will double the speed of audio. You can use any value between 0.5 and 2.0 for audio. Stack Exchange has a good overview to get you started with FFmpeg. You should also check out the official documentation at ffmpeg.org or the wiki at trac.ffmpeg.org to know about all the possible things you can do with FFmpeg. The future is wireless and the trend is now being carried over by android phones too . These days a very few people actually prefer to use USB cables for transferring files between their PC’s and their phones / tablets . The reason being transferring files wirelessly is very convenient than transferring files through a USB cable and adding to the advantages, you don’t have to wait beside your PC until the transfers complete. While your files are being transferred to your phone you can carry on with your other works . There are many apps on the android store that can help you to transfer files wirelessly between your PC and Android phones . Among these apps, some come with bare and basic features like simply transferring files over WiFi and some add many more exciting features apart from the basic file transferring feature. For me, when it comes to features, i believe in the more the merrier. So in this guide I will make make use of an feature packed app to transfer files between a PC and an android phone . AirDroid is one such popular and feature packed free android app which i use primarily to transfer files wirelessly across my phone and PC . The app can be used to both receive and send files wirelessly between your PC and android phone. 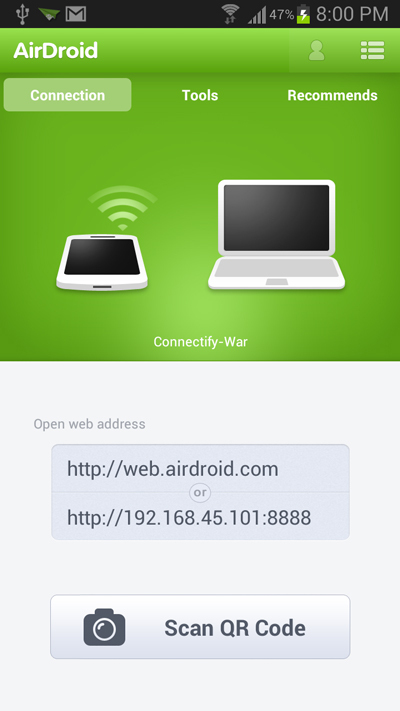 Airdroid is basically an android app which helps to manage your android phone from your PC’s web browser . The web interface of the app is very neat and the usability is the best among all the apps in its class. All in all its simple, beautiful and highly effective . All of this and more can be performed from AirDroid’s PC interface itself . Now lets move ahead and find out how we can use airdroid to transfer files wirelessly between your PC and Android phone over a WiFi network . Step 1: Install AirDroid from the Google play store and open the app on your phone . 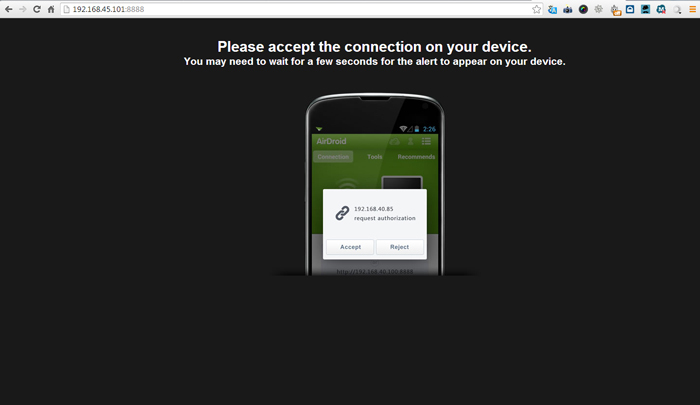 Step 3: Open the AirDroid app and Instantly the app will detect your WiFi network and start the AirDroid server . The app will provide you with an ip address , which you have to type into your PC’s web browser to connect to the AirDroid server . 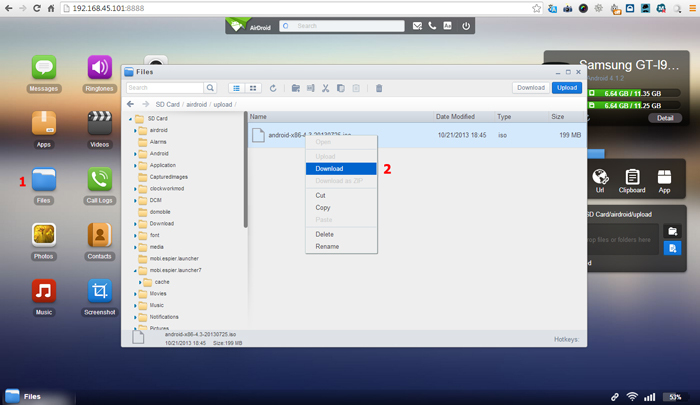 Step 4: Manually type in the ip address provided by the AirDroid app in your web browser and press enter . 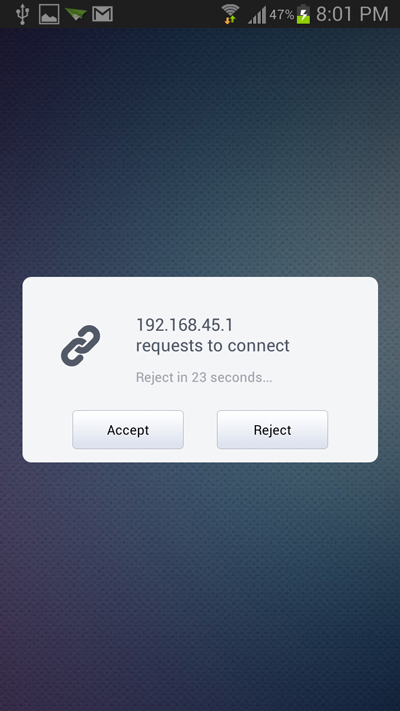 Simultaneously You will see the below screen and your android phone will prompt you to accept the connection . Step 5: On your android phone , tap on accept and you will be able to access the AirDroid interface on your PC’s web browser . Step 6: To the right of AirDroid web interface , there is a toolbox , click the file icon and next you can select from the folder / files icon to transfer a file or folder to your android phone . Step 7: To transfer a file to you android phone select the file tab from the AirDroid toolbox and click on the folder /file icon to select from any file from your PC . As soon as you select the file , AirDroid will start transferring the file to your android phone . similarly you can also transfer entire folders to your android phone . If you want to transfer files from your Android phone to your PC , then you have to use the Airdroid web interface on your PC . All you need to do is click on the files icon from AirDroid’s web interface and select a file from the file browser that opens up , right click on any file and select download to download the file to your PC . The file will be downloaded as regular downloads in your web browser and can be accessed from the download menu . Here is a screenshot of the transfer speed i was getting while downloading files from my android phone . I was able to get a constant download speed of 3.5 Mbps which peaked around 4Mbps . FFmpeg is an amazing collection of open-source tools that can record and stream video and audio. However, it can also transcode video and audio (convert the files to different formats), and that is what has me so excited. There’s also a great PHP package called ffmpeg-phpthat allows for easy use of FFmpeg from inside PHP scripts. Today, I’m going to see if I can’t help you get both of these set up on your system. Admittedly, it’s been a while since I’ve tried to install FFmpeg, about two years. I recently thought up some ideas on how I’d like to use FFmpeg, so I thought it was time to give it a try yet again. Today, I’m proud to say that installing FFmpeg is so much easier to install compared to the past, that I dare say it’s simple. Here is my experience with installing FFmpeg on my server and how to fix the pitfalls that I encountered. Note that I did all the following steps on a CentOS server. The specific version is CentOS x64 6.7. These instructions can work for other distros with little or no modifications, but some distros will be completely different. For example, theDAG RPM Repository that I’m using (more info below) has support for the following distros: Red Hat Enterprise Linux, Fedora Core, Yellow Dog Linux, Aurora Linux, CentOS, Scientific Linux (they really need to get a verified SSL cert), TaoLinux, WhiteBox Linux, Lineox, andBLAG. Other distros will need to use a different repository. If you successfully get FFmpeg running on another distro, please comment your changes here and I’ll update the post (and make sure you get credit of course). Also note that I experienced some bumps in the road while installing everything. While many of you may not experience these issues, I found it important to document these problems and how I fixed them in case you encounter them. The first thing that you need to do is set up the DAG repository. This repository is an actively-maintained repository that provides a staggering number of packages with current or near current builds. Adding this repository is a great way to run the latest offerings of many packages. Create and open a new file called /etc/yum.repos.d/dag.repo. I ran “vi /etc/yum.repos.d/dag.repo“. Finally, save and close the file. The DAG: Frequently Asked Questions page has additional instructions on how to get the repository loaded and working on your distro. Now that DAG is setup, it’s a good idea to update all your packages. Depending on the packages you currently have installed, this could potentially upgrade, install, or replace numerous packages that may or may not be very important to you. Make sure you carefully look through that list and do any necessary preparations before telling yum that it can go ahead. For example, yum told me that it was going to replace my current MySQL interface library for Perl with a new one. I added to my check list a note to verify that my Perl code functioned correctly after the install. I ran into another hitch when I told yum to go ahead with the update. It informed me that my current version of Subversion conflicted with the new version it wanted to install. When this happens, you need to remove the old package before proceeding. This time, I made backups of all of my repositories and my /etc/sysconfig/svnserve file before proceeding just in case. I then removed Subversion “yum remove subversion“, ran the update process “yum update“, and installed Subversion again “yum install subversion“. Now you are ready to install FFmpeg with yum. I wanted to install all the available FFmpeg packages, so I first asked yum what was available. Searching through the results, I found that three packages need to be installed: ffmpeg, ffmpeg-devel, and ffmpeg-libpostproc. Note: If you install ffmpeg-libpostproc, the entire FFmpeg software library changes from the LGPL license to the GPL license. After a couple of minutes, the packages and the packages that they depend on were installed. I simply ran “ffmpeg” from the command line, and I took the lack of threatening error or warning messages as a good sign that things were working. I often work with programs through command line calls in code, but I wanted something more robust this time, so I looked around and foundffmpeg-php. Based on the API, it looks to be a great tool to interface PHP and FFmpeg. In case you are wondering what php-devel is for, it installs the phpize program which is used to install ffmpeg-php. This may seem like a lot of work when I earlier described this process as “simple,” but trust me that this is a thousand times easier than when I first tried installing FFmpeg. I think I spent three hours working on installing FFmpeg just to find out that it didn’t work the first time I tried. Time and time again, package management has proven to be an extremely powerful tool. While I know the value of manually configuring and compiling code, the ease of simply using a package manager can reduce the time needed to install and manage software from hours or days to minutes. I’m glad to see that FFmpeg has benefited from the use of these package managers and great repositories like the DAG RPM Repository.